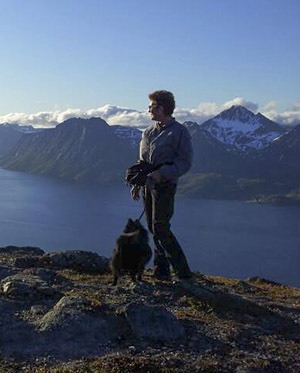 In the early 2000s Kirsten Frantzen from Kasfjord in the city of Harstad began noticing discomfort when she went hiking in the mountains. -Every time I exerted myself, my temples were throbbing vigorously, and it was very uncomfortable. The symptoms were also getting stronger as time went by. In 2004 she went to a neurologist who sent her to have an MRI and an ultrasound performed. The results showed that the neck artery on the left side was fifty percent blocked. She was told by the doctor that if the condition worsened, surgery would be required, otherwise she would have to live with this. Kirsten was prescibed blood-thinning tablets to alleviate any problems. -The problem was that the situation worsened. Every time I walked up the stairs of the house, I felt my head throbbing. Also when I laid down on my bed, my head felt like it was banging. In 2006, 75 percent of the artery was clogged, which was serious, Kirsten says. The doctor said that at this point, surgery was the only alternative . She still wanted to wait one more year. There were great risks accociated with such an operation. According to the doctor there was a fifty percent chance that she could die or get brain damage from this operation. Naturally Kirsten was anxious. Around the same time she heard about a lady who had been healed from clogged arteries surrounding the heart, after Svein-Magne Pedersen had prayed for her. This caused her to react. -I figured that I could try calling Svein-Magne Pedersen. Healing was not an unknown phenomenon to me. My grandmother had been healed from holes in the esophagus a few years ago. When I called the prayer line, I felt a very pleasant and nice atmosphere over the conversation. It was the kind of warmth and security that I pretty much only can relate to my own father when he was alive. After receiving prayer Kirsten did not think any more about the situation. At the next control in 2007, she was in for a shock. -When the doctor started to listen to me, she got a strange look on her face. She used a lot of time and she also checked the healthy side of the neck as well. I figured that now I would be sent straight to the hospital in Tromsø for an immediate surgery. -Have you made any drastic changes to your lifestyle? the doctor asked. Kirsten replied that she had not made any drastic changes. The doctor also wondered if she had stopped smoking, something she had not done. -This I can not understand, the clogging is gone, and this should not be possible. Here the arteries are completely fine, said the neurologist shocked. Kirsten was ecstatic. Because of the changes that had taken place, she did not need to have surgery or have check-ups anymore. "Come back in ten years," the doctor said. In the time that followed, Kirsten has been doing a lot of hiking, and all the pain in the head is gone. Now it has been almost six years, and the veins are every bit as clear. -It's amazing what I have experienced. I am not in doubt that a miracle occurred when I received prayer, says Kirsten Frantzen.